Verify Your Age To Continue... Click Enter only if you are at least 18+ years of age. Smokers should be offered and encouraged to use e-cigarettes to help them quit, says a leading medical body. The UK's Royal College of Physicians says there is resounding evidence that e-cigarettes are "much safer" than smoking and aid quitting. With the right checks and measures, vaping could improve the lives of millions of people, it says in a new, 200-page report. It says fears that e-cigarettes are a gateway to smoking are unfounded. But, by and large, people who want to use electronic cigarettes will still need to buy them rather than get them on the NHS. Should we switch from tobacco to e-cigarettes? UK doctors can only prescribe e-cigarettes if they have been licensed as a "quit smoking aid" - something that requires strict regulation. Few manufacturers go down this route and instead sell products to satisfy users' desire for nicotine without the harmful chemicals produced by tobacco. Sales of e-cigarettes have been rising steadily since the first went on sale in 2007 in the UK. Since 2012, they have replaced nicotine patches and gum to become the most popular choice of smoking cessation aid in England. Around one in 20 adults in England uses e-cigarettes, and nearly all of these are ex-smokers or current smokers who are trying to cut down or quit. E-cigarettes have remained controversial and this year ministers in Walesattempted to ban them from public places. The Royal College of Physicians says smokers who use e-cigarettes or prescribed medications - with support from their doctor - are more likely to quit permanently. 3. The mixture becomes vapour and is inhaled. Many e-cigarettes have an LED light as a cosmetic feature to simulate traditional cigarette glow. Different brands of e-cigarettes contain different chemical concentrations. 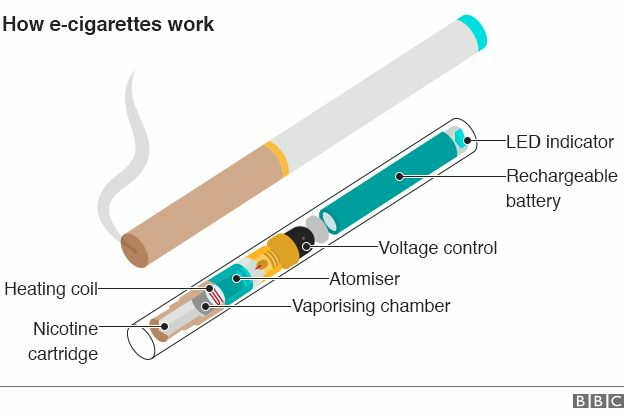 And in terms of long-term health hazards, e-cigarettes are at least 95% safer than regular cigarettes - something Public Health England has also said. But that does not mean they are entirely risk-free. Prof Simon Capewell, of the Faculty of Public Health, said there were still many unknown factors. "We don't know enough yet about the long-term effects of vaping on people's health, which is why we need more research. "The best thing anyone can do if they want to quit smoking is talk to their GP: there's solid evidence that NHS quit-smoking services help people kick the habit for good." But Prof John Britton, who co-authored the RCP report, says e-cigarettes are extremely positive for public health and should be "encouraged and endorsed". He said: "The public need to be reassured this is not a new nicotine epidemic in the making. E-cigarettes have very little downside and a lot of potential benefit." According to Public Health England, smokers should consider using e-cigarettes alongside NHS quit-smoking services. Around a third of UK smokers try to quit each year, but only one in every six of those succeeds. New EU laws are due to come into force in May that will set safety and quality standards for all e-cigarettes and refills. Manufacturers will be required to disclose the purity of their products to consumers. Dr Tim Ballard, from the Royal College of GPs, said: "Moving forward we would be looking for clear evidence that making e-cigarettes available on prescription as part of a wider smoking cessation scheme is a wise use of both scant NHS funds and GP practice resources, before the College could get behind it. "It is not just the cost of the product that needs taking into account, but the time and resources that are involved in assessing patients, and monitoring their progress over a prolonged period of time. "We reiterate our calls for NICE to take a leading role in establishing whether making e-cigarettes available on prescription is the best way forward." A Department of Health spokesperson said: "The best thing a smoker can do for their health is to quit smoking. "We know that there are now over a million people who have completely replaced smoking with e-cigarettes and that the evidence indicates that they are significantly less harmful to health than smoking tobacco. "We want to see a wide range of good quality e-cigarettes on the market including licensed products whose safety, quality and effectiveness are independently assured." Media captionSarah Jakes quit smoking three years ago and says e-cigarettes were a "no-brainer"